Originating in India, this form of massage has been used for centuries as a means of stress relief. The Indian Head Massage techniques of today have evolved from traditional rituals of family grooming. Over generations, Indian women have been taught by their mothers to massage different oils into their hair in order to maintain its condition. Indian barbers have used head massage as part of their treatment in their shops. Traditional Indian Head Massage as practised by women in India was restricted to the head and hair. With the westernisation of the art comes the added treatment areas of the upper back, neck, shoulders and upper arms. 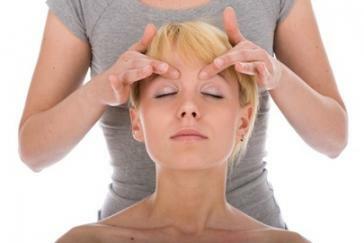 The head and neck areas are susceptible to stress and tension and Indian Head Massage ideally addresses these areas. It helps disperse toxins, improves circulation and encourages a feeling of general well-being. Massaging the back, shoulders, head and neck relaxes and soothes sore and tense muscles, reducing fatigue and greatly improving circulation. This type of massage is deeply relaxing and helps balance the bodies energy flow. Relaxation of muscle & nerve fibres Relieves tension, aches and pains. Increases oxygen to brain Encourages clear thinking & improves circulation. Energy flow to body and calm. Reduces stimulation of nervous system Reduces stress & anxiety, helps slow down breathing. 1. Almond Oil - whose beneficial properties include reducing aches, pains and stiffness, and generally promoting healthy hair. 2. Coconut Oil - this is good for moisturising the skin and encouraging hair growth. It also balances the body. 3. Mustard Oil - like almond oil it is useful for relieving aches, pains and stiffness. It can be used to reduce swelling and is also good for purifying the blood by opening the pores. 4. Olive Oil - has very similar properties to mustard oil but without the pungent smell. 5. Sesame Oil - this is probably the most commonly used oil. It can be used to relieve aches, pains and stiffness but is also said to benefit hair growth and reduce greying while promoting a natural shine. In addition to the oils above, a blend of essential oils may also be applied to the scalp. The most popular of which are Lavender and Rosemary. Lavender is used for its calming relaxing effect, while Rosemary, which also helps relieve aches and stress, gives an uplifting feeling and sense of being energised. One of the advantages of this treatment is that it can be performed while the subject is fully clothed and in a seated position. When washing the hair after, ensure that the shampoo is applied onto dry hair as the shampoo will slip off wet hair that has oil on.